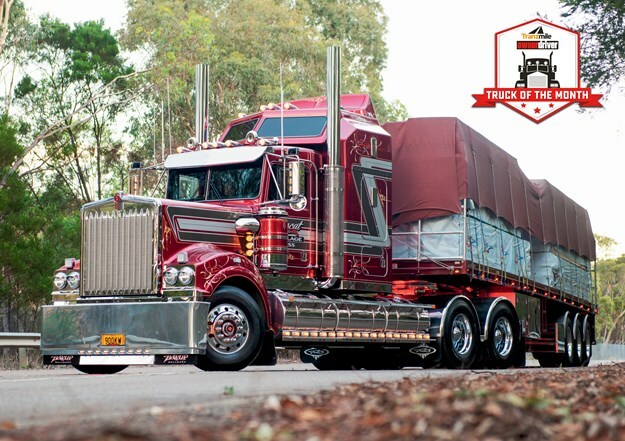 A visit to the 2017 Brisbane Truck Show was enough for the Muscat family to be sold on the Kenworth Legend 900. Problem is, one was just not enough. They say ‘a picture is worth a thousand words’, or in today’s terms ‘a pixel is worth 1024 bits’. Either way, you get my drift. However, when it comes to Muscat Haulage, whatever I write here has very little chance of getting read. 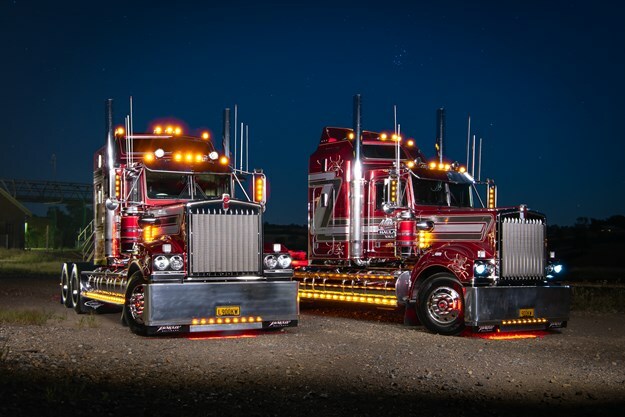 The truth is, I’m even distracted by the images of the Muscat’s Kenworth Legend 900s myself as I view them on the screen beside me as I write this story. I completely understand if you haven’t read past the first few paragraphs, but if I can drag your attention off the shiny big trucks for a minute, it’s worth reading up on a family that is so entrenched in trucking, I’m pretty sure they would have diesel-scented air fresheners hanging throughout the house. Before we get too far into the tale of Muscat Haulage and its fantastic fleet of Kenworths, I’d like to elaborate on the preceding paragraph. I wasn’t exaggerating about the trucking passion that runs right through this family. As a truck lover myself, I can relate to the addiction that can arise from being immersed in the industry. Sitting down at the Muscat family table I’m surrounded by three generations of Muscats that live and breathe trucks. It has been that way since Andrew and Chris Muscat were kids and used to scrap over who would help park dad’s International TranStar when he came home. Anthony Muscat vividly recalls: "I used to pull up the street in front of the house and Andrew and Chris used to fight over which one was going to turn the truck around. "Fully loaded 27 or 28 tonne, they could barely see over the dash." Hence, the family was indoctrinated into transport very early on and their addiction has kept growing ever since. However, the Muscat Haulage story officially started with Anthony and Bev Muscat back in 1977. Anthony, more commonly known as Tony, had been driving for his older brothers, both of whom owned trucks. Tony began working for Michael Muscat at Muscat Furniture Express before driving for Charlie Muscat, carting produce from Griffith to Newcastle markets. Tony and his wife Beth then decided to purchase their own truck to do market runs. A 3070 Eagle was the first of many Internationals that Tony ran with his trusty flattop behind him. An Atkinson, an S-line and a TranStar all wore the Muscat colours at one time until International was bought out by Iveco. The change in design was enough to chip away at Tony’s parochial truck choices and he switched to his first Kenworth, a 1993 T950. By the time Tony took ownership of the Kenworth, the flattops had made way for tipper work. The Muscat family were hauling grain, fertiliser and basically anything that could slide out the tailgate. At one stage the big T950 had both father and son behind the wheel with Tony and Chris doubling shifting. In 1999 the T950 was traded in and Tony put one of the first T904 Kenworths, powered by the new Cummins 600hp, on the road. Tony made sure he gave the engine a workout. "The things I used to do, you can’t really say," he smiles. "I didn’t need road-trains, just a single trailer will do." The new T904 was also the truck that youngest son Andrew ‘officially’ learnt to drive in as well. "That was a pretty tall thing," Andrew exclaims. "Everyone else talks about learning to drive in 1418 Benzs and I pipe up that I learnt to drive in a 904." Through the start of the new millennium a regional drought and the tough economic climate forced the family out of tippers and back into flattop work. That worked out well as it’s this market and this specialty area that they have stuck with now for almost 20 years that has seen the company solidify. With the move back into flattops, Tony found his workload increasing as his reputation grew. The steady growth saw Andrew leave his job driving car carriers to purchase his own truck and join Muscat Haulage. Not a big bonneted truck like the 904, Andrew opted for a K104 Aerodyne. It’s the exact truck Andrew recalls drawing a lot when he was a kid. Buying a truck at just 22 was a challenge in itself but Andrew is quick to point out the assistance his family has given him. "I couldn’t get insurance for myself, I couldn’t get finance approved because of my age. So, mum and dad helped me there," he says. "It was really their truck … I just drove it." Andrew went on to sum up one of the rather unique facets of Muscat Haulage that has made the family so successful. "There’s no ‘this is mine, that’s yours’," he explains. "It’s ‘this is ours’. "Even right from kids it was our truck. Dad would get home and we’d be there helping." This family connection has repeated itself with the next generation. Chris’s sons Ethan and Blake are at the yard every chance they can. "You could be in at 10pm at night and they’ll be up there to wash the truck or help change a tyre," Andrew says. Even Andrew’s three year old son Cohan was washing trucks from the moment he could walk and sets land speed records getting to the passenger seat if he thinks he will get a ride. With Tony in the T904 and Andrew in his Aerodyne, Chris decided to buy his own truck. However he bucked the trend and bought a Mack which he put into tipper work for a couple of years before the family flattop business again reached a high point, so Chris returned to the world of ropes and tarps. Another pat on the back has to go to Tony here for his forethought and training systems when the kids were young. There’s a reason the Muscat tarp jobs look like they are straight out of a textbook. "Yeah, Dad used to take the old ropes of the tarps and tie them to the swing for us to practice," Chris says, recalling countless hours of practising knots and hitches. The Mack was traded in when Chris returned to the flattop brigade, replaced with a brand new 2008 Kenworth T908. The three-truck fleet then spent the next decade or so head down, bum up and getting the job done. However, a change to the fleet was in the air when rumours of the new Legend 900 began to leak out. 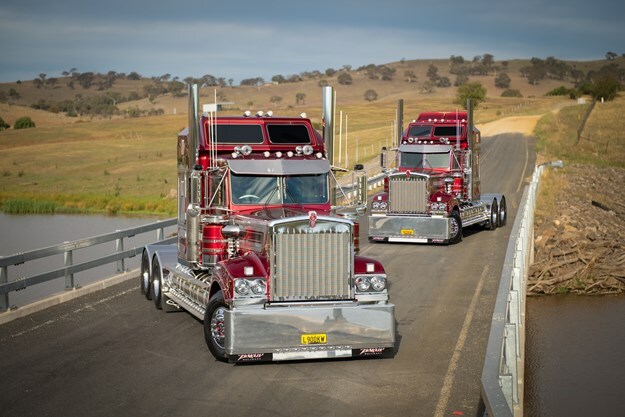 In 2017 the Muscats attended the Brisbane Truck Show where Kenworth officially unveiled their Limited Edition Legend 900. "The Aerodyne had served us well, but I wanted a big bonnet. I had little man syndrome," Andrew jokes. "We had a look at the prototype and yeah, fell in love with it." The family was so impressed with the Legend 900s they ordered two. Andrew wanted to get build #77 to commemorate the year Tony started the business, so Chris got #76. As it happened Chris Potbury, a very close family friend of the Muscats, was in Brisbane with them on that day and ended up securing build #78 as well. Like everything in the family business, attention to detail is paramount for Muscat Haulage. The same goes when speccing a truck. 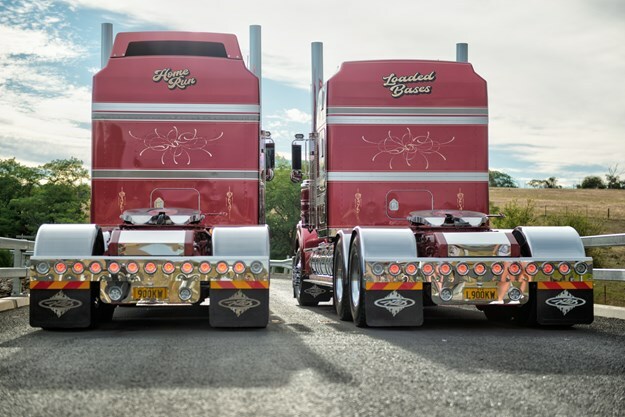 Total Fleet Imaging in Melbourne painted the 900s. "Adam [Bennett] and his team were fantastic," Andrew says, especially, as he points out, when it came to getting the lines identical between the two trucks. "They sat there with a measuring tape on every rivet, every spot," he says. Considering the trucks were exactly six months apart, that’s impressive workmanship. Both trucks have also had the full Klos Custom Trucks’ workover, with Andrew admitting the entire process seemed like a mammoth task from the beginning. "Me, Chris and the boys sat down and started with a wish list. Then we would cross things off the list, only we didn’t cross anything off." He says CustomAir also had a big part to play in the fitout, installing the TV, inverter and microwave. As well as the sleeper air-con, they also installed a Waeco bunk heater. Kenny Reeves at Truck Bras made matching sleeper sock covers, just to keep the inside as immaculate as the outside. With this much work and so much attention to detail, it was no wonder these trucks were a six-month build. Andrew’s truck may have 100,000km more on the clock than Chris’s, but looks just as impressive. In fact, anyone could be mistaken for thinking the two Kenworths are show trucks. But they’re not. These are definite working trucks and they clock up the mileage. The fact they look brand new is a testament to the attention they get from not just Chris and Andrew but the entire family. This includes Tony’s eldest son Michael who plays an important role, spending his weekends looking after the servicing of the fleet. Preventative maintenance has been of huge importance to the company and has paid dividends, no more so than when you look at the condition of the original T904 that Tony still drives. As it approaches five million kilometres it looks and runs as good as it did when it hit the road 20 years ago. Tony still travels with his small paint brushes for cleaning the dash every chance he can. That pride in the job has flowed through the generations. I’m pretty sure both Andrew and Chris were handed polishing clothes the moment they left the maternity ward and most likely have kept more than a few cleaning companies in business on their own. Their love of the industry and pride in their trucks has created an aura around them that means like-minded trucking fans head their way. They have two fulltime drivers – James Hadley in the T908 and Cam Rockliff in the company’s 1998 T900. Both are young drivers earning their stripes and enjoy learning the old school ways, not just the tarping and tying down, but the attitude and respect required in the profession. In addition, they take immense pride in the trucks that the Muscats have intrusted them with and, as is the Muscat way, they look like fulltime show trucks. Anyway, that’s enough from me. Now, just sit back and take a good look at the photos of these legendary trucks.